This text by CAROLINE DIONNE is published alongside of ALEXANDRE DAVID‘S Moving Around exhibition. For roughly a decade, Alexandre David has been conducting spatial experiments. His practice as a sculptor has led to a series of interventions in various locations, always producing slight perceptual changes minor yet potent modifications in how we relate to a given space thus raising the question of our relationship to spatiality in general and, more specifically, to the spaces of our daily lives, and to architecture. Halfway between sculpture and installation, the large-scale three dimensional pieces that he carefully conceives and builds, in most cases using standard plywood sheets, are site specific. Often assembled or constructed in situ, each piece is integrated to a given, preexisting space a gallery, a room in a museum, an open space in the city. Although each intervention functions independently, taken as a whole, the corpus of his work involves a process of reiteration, as if it were guided by one key artistic intuition. Approaching the works as a series of variations on a theme, one quickly detects their genealogy and the shifts in the strategies at play. Some early pieces function as displayed objects (Deux vues d’ensemble, Galerie B-312, 2004 or Sans titre, Optica, 2007). Like giant shelves or extruded geometrical planes hung from the walls, these wooden volumes momentarily fill up part of the existing space, transforming both the room itself and our physical experience of it. 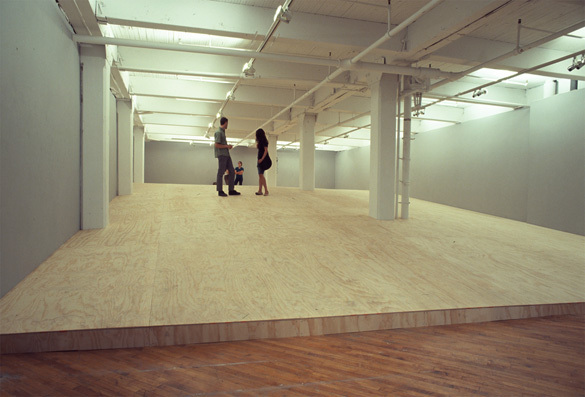 In other instances, the work occupies a defined portion of the floor within a room (Deux choses diffrentes, Quartier Ephmre, 2004, Tourner le coin, La Chambre Blanche, 2007 or Over Here, Aceartinc, 2009). Built as platforms, such pieces suggest the idea of a stage or a tribune: an elevated floor onto which people can walk, lie down, sit, perform, etc. The presence of a new volume emerging from the floor, as well as the built-in changes in height, sheltering elements, inclination, or slope, can modify existing circulation patterns and propose new ways to inhabit or use a given space. David’s work thus points towards architecture. Not only because the work is built or shown in such close proximity to the existing architectural features of the existing spaces but also, and this is perhaps it’s major strength, because it purposefully belongs to another realm, somewhat maintaining architecture at bay. In the process of composition leading to the final measurements and extremely precise execution of his volumes, the artist draws from basic architectural dimensions the height of a step in a flight of stairs, the width of a doorway, the level of a windowsill, etc. However, the work does not operate in a representational mode: it does not attempt to bring to front, in the gallery, commentaries on, ideas about or elements of existing architecture. Rather, its relation to architecture relies on the fact that on a day-to-day basis, we generally tend to take architecture for granted. Buildings are there, all around us, delineating the spaces in which our lives take place, ubiquitous to such an extent that their architecture very often goes unnoticed. And yet, as we go about our daily activities, we nonetheless accumulate perceptual experiences, memories and impressions that are shaped by a shared, common architectural ground. In that sense, David’s spatial explorations have been addressing, for the most part, a simple yet open-ended philosophical problem: the phenomenon of perception. Understood both as a bodily and mental experience of space, in time, perception is at the center of our everyday relationship to the world, which is, at least for city dwellers, constantly mediated by architecture. It is as we perceive our surroundings, always from within, that we get a sense of where and, to some extend, of who we are: perception is thus a means for the production of knowledge. But at the hearth of the concept lies a paradox: while perception requires presence (I am here, now, surrounded by objects), the things perceived (some objects, a building, a street, a city square) always point to something more, to the idea of an elsewhere, to a space existing behind or beyond the limits of one’s perception. The space that lies beyond our perceptual horizon is dual in nature. It exists both in its raw materiality and in the knowledge conscious or not that we have of it. This paradoxical aspect of perception becomes explicit in an experiment that modifies space in the most drastic manner (Some space, Gallery Grunt, 2009). In the specific case of this installation, the plywood sculpture takes up the dimensions of the room itself, covering walls, floor and ceiling, reframing another room around an existing window. This time, the wooden box is experienced from the inside. The real physical limits of the original room momentarily vanish from view. And yet, the visitor knows, in a somewhat embodied manner, based on an accumulation of latent, daily architectural experiences and memories that the actual gallery walls are still there behind the wooden surface of the installation. In his most recent work, David revisits the strategy of space-filling volumes. A very large wooden object is resting on an equally large table at the center of the room. The remaining space becomes limited, leaving only a narrow passage that allows visitors to go around the object. Progressively, the nature of the wooden box changes. From something that seems to simply rest on a table, it becomes a canopied element sheltering a small area that can eventually be used and appropriated. Pushing this idea of going around an object / discovering a place further, the artist chooses to open up the building process as part of the intervention. Visitors can thus move around the object in close proximity, not only as a finished form, but as it comes into being. Here again, great care in precision and geometrical simplicity guides the constructions of the piece. But far from producing a somewhat precious object, this allows the installation to stand for what it is, conveying to it this abstract quality that allows us to see it, in a rather pragmatic sense, as an arrested moment of perception, as one possibility within the range of many other possible ways of configuring and using a space. Set in tension with its architectural surroundings, it leaves architecture where it belongs, at the background of our daily activities, nonetheless pointing to the larger question of how we collectively choose to dwell in space. CAROLINE DIONNE is co-founder and head curator at Espace TILT, an artist-run center based in Renens, Switzerland. Trained in architecture, she holds a PhD in the History and Theory of Architecture from McGill University. Dionne is also an independent writer and editor. Some of her writings have appeared in Tracs (Lausanne), Chora: intervals in the philosophy of architecture (Montral), Public (Toronto), Inter art actuel, Spirale and ETC (Montral). She also published catalogue essays for Articule and Galerie B-312 in Montral and Or Gallery in Vancouver. Dionne lives and works in Lausanne, Switzerland.